Use silicone wristbands to promote poison prevention week. Every year, the third week in March has been set aside as National Poison Prevention Week to raise awareness about the issue of accidental poisonings, particularly among children, and to educate people about how to make their homes and lives safer. Since 1961, when Congress established National Poison Prevention Week, events have been established nationwide to help individuals, families, and communities recognize the ways to be involved in preventing poisoning. Consider educating your daycare parents or school children and others by creating Poison Prevention Week bracelets! Like the proverbial string around the finger as a reminder, poison prevention week bracelets can help adults and children remember the importance of keeping a poison-safe home and school. The wristbands’ bright colors and helpful sayings (such as “Children act fast. So do poisons,” “Prevent food poisoning by cooking to the right temp,” “Keep medicines locked away,” or “Accidents happen. Be prepared” or even the toll-free poison emergencies hotline number, “1-800-222-1222”) can live beyond National Poison Prevention Week and into people’s everyday lives as reminders of safe living. According to PoisonPrevention.org, every year, more than 2 million poisonings are reported, and of them, 90 percent happen right in the home. In fact, according to the CDC, more than 300 kids are treated in emergency rooms every day because of poisonings, and of them, two will die. Everything from laundry and cleaning supplies to medications and undercooked foods can be dangerous and even lethal to children. That’s why it’s so important for families and individuals to understand what they can do to prevent accidental poisonings. 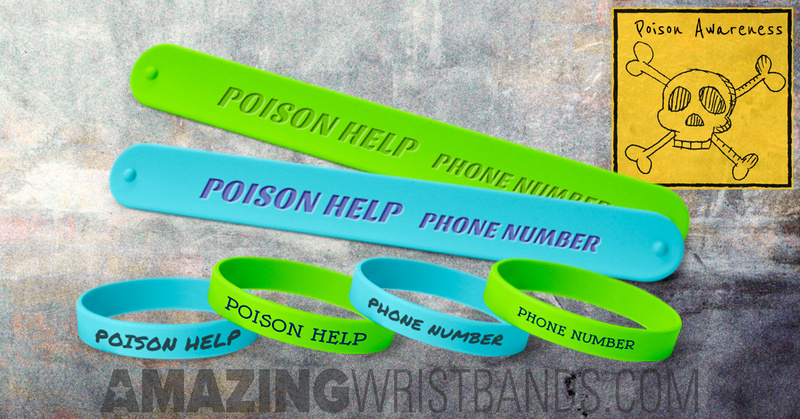 Why Buy National Poison Prevention Week Bracelets from Amazing Wristbands? Amazing Wristbands is a leading provider of customized silicone wristbands available online, including National Poison Prevention Week bracelets. Our wristbands are comfortable, durable, and non-allergenic, made of 100% silicone. Many of our wristbands can be created with our easy-to-use online tool. In addition to standard wristbands, AmazingWristbands.com also offers super popular slap bands that “snap” to a person’s wrist, as well as half-inch bands, thicker one-inch bands, adjustable bands, USB bands, silicone rings, and silicone key chains. 100% Silicone Wristbands for your National Poison Prevention Week awareness campaign. FREE artwork and design for your National Poison Prevention Week bracelets. Build your own National Poison Prevention Week bracelets online!